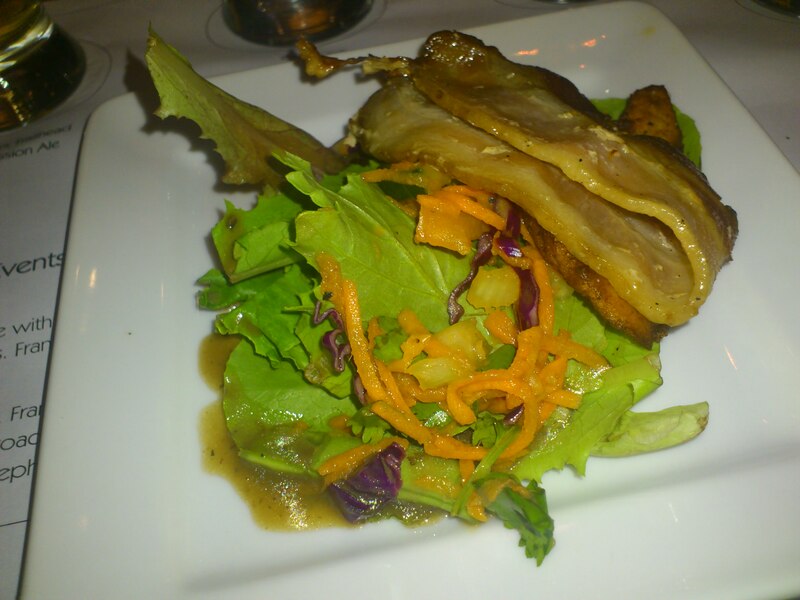 Pumphouse Pub Bacon and Beer Dinner! Another Longtable dinner at the Pumphouse Pub in Richmond has come and gone and this one was a doozy! A five course bacon themed dinner, each course paired with a beer from the Beerthirst portfolio, bacon and beer? Yes please!! This dinner had the added twist of being a fundraiser for local golf phenom Nathan Leonhardt with all proceeds going to help his dream of playing on the PGA Tour. 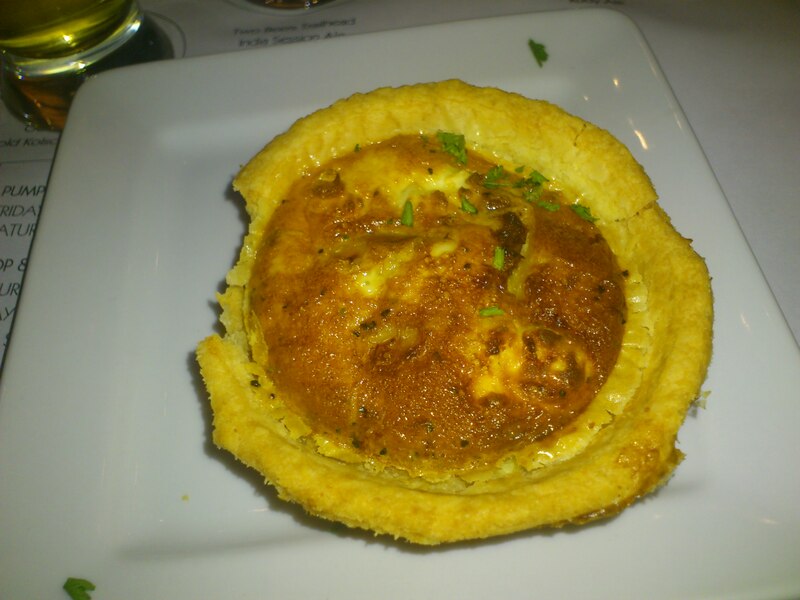 Course one was a bacon, caramelized onion and goat cheese quiche paired with Odin Brewing Co‘s Freya’s Gold Kolsch style ale. The Quiche had a nice flaky crust with the bacon and caramelized onion giving the filling a salty richness with a slight tang from the goat cheese, very tasty. The Kolsch pairs well with any food, which is what Odin’s main goal is when they make a beer. It’s a nice light palette cleansing beer. Course two was fried plantains with a spicy Thai bacon salad. It was paired with the Trailhead ISA from Two Beers Brewing Co. The plantains were great and complimented the Thai salad very well. Throw a little bacon in the mix and you really can’t go wrong. The Trailhead ISA was a nice pairing for this dish. It is a very sessionable beer that doesn’t over power the delicate flavours of the plantains. another winner. 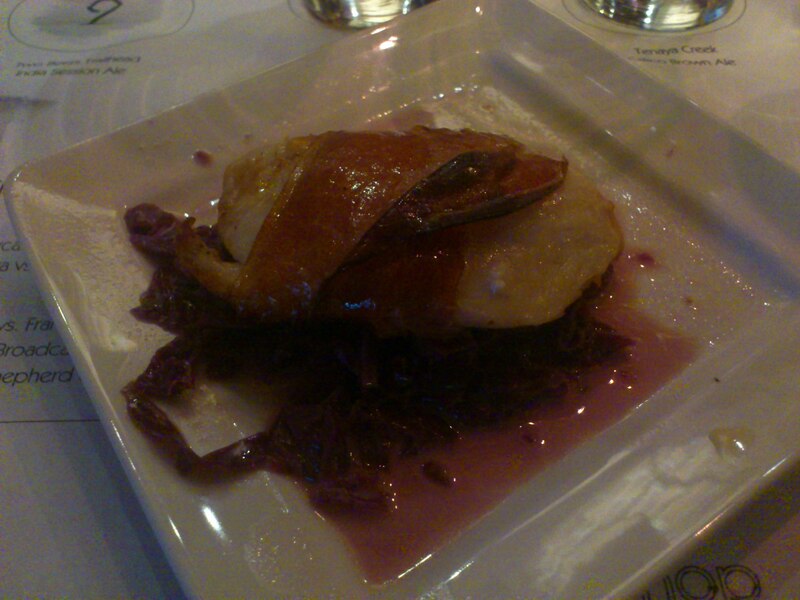 Course three was prosciutto wrapped chicken with beurre rouge sauce. It was paired with Odin Brewing Co’s Odin’s Gift Ruby Ale. The chicken was cooked perfectly, quite an accomplishment when cooking for 60-70 people. The prosciutto was a nice salty pork jacket hugging the chicken, delicious. The beurre rouge sauce was good but the dish could’ve used a bit more of it and it could’ve been a little thicker. The Odin’s gift Ruby Ale pairs well with salty meat so it was a hit with the pork snuggled chicken. 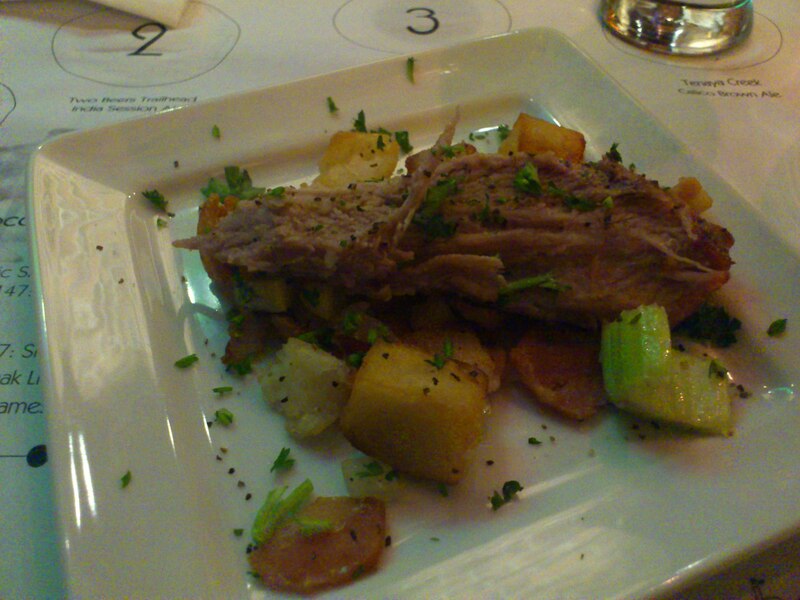 Course four was a slow braised pork shoulder with apples, onions and bacon with a few pieces of roasted potato. It was paired with Tenaya Creek Brewing Co‘s Calico Brown Ale. The pork shoulder was well cooked and very tender without being dry but it lacked seasoning. The apple and bacon were a great pair but the dish needed more of both and the potato seemed a little out of place. This dish was a few small tweaks away from being incredible. The Calico Brown Ale paired well with the pork. It’s a hoppy brown ale and I have to say that it’s one of my favourites from the Las Vegas brewery. 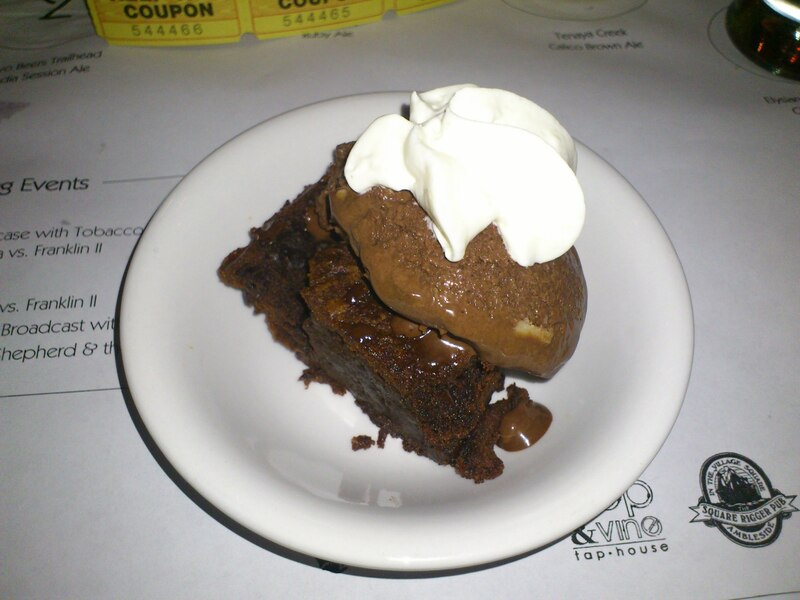 The fifth and final course was a warm chocolate chilli brownie with chocolate bacon ice cream. It was paired with Elysian Brewing Co’s Peste Chocolate Chilli Ale. WOW! The brownie was moist and rich and had a great chilli kick to it, incredible. The chocolate bacon ice cream was perfect to balance the heat from the chilli in the brownie. This dessert was outstanding. The Peste Chocolate Chilli Ale has mellowed some since I first tried it but this beer was meant for this dish, it was an unbelievably good pairing. 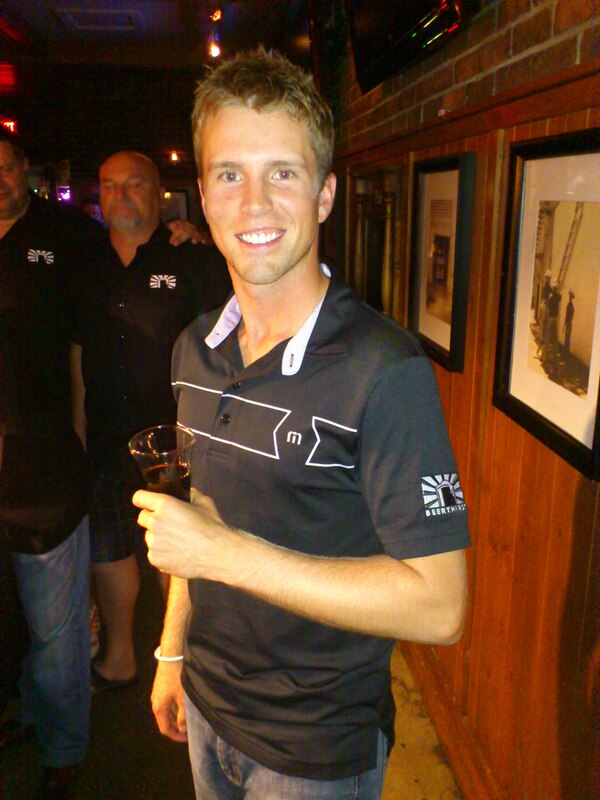 It was great chatting with Nathan about his ambitions in the professional golf world and I’m happy that Beerthirst and The Pumphouse could raise some money to help him on his quest. Nathan plays on the Canadian Tour and has had success as an amateur and attended Northwood Texas University on a golf scholarship. Few people realize how expensive it is to play professional golf so every penny counts! Good luck Nathan, we’ll be watching your career and cheering for you!